There's a small film from a big director that might get lost in the shuffle of this weekend's flurry of new releases. 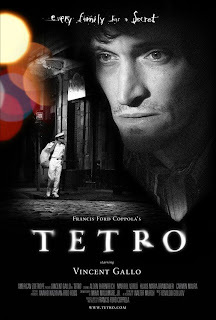 Tetro is filled with bold, brash and at times boisterous filmmaking, directed by none other than Francis Ford Coppola. And once again the man who gave us The Godfather is bringing us back into the land of brothers. But this is no ordinary pair of siblings. There is Ben, the sailor, well really a waiter from a cruise ship, who longs to reunite with his volatile older brother Tetro. 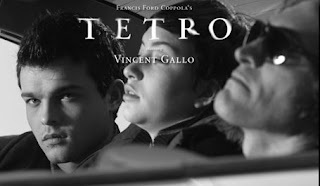 Actor Vincent Gallo does his thing, simmering through this movie. His sharp angular face is a good match for the playful cinematography, filled with light shimmering like a reflecting pool. Coppola has not directed since 2007 and Youth Without Youth . He's said of Tetro, "Nothing in this movie ever really happened, but it's all true." And we are swimming in Coppola's passions here. There references to obscure films, operas and masquerades. This is a rich film, perhaps too rich for some, but it's also refreshing, like discovering a time capsule, uninfected by the BPM editing style of the 2000s. True it does go a little off the rails in the last act, Coppola throwing in jabs at critics while Gallo struts around like a greased up groupie for ShaNaNa. But all in all, I say it's a worthy immersion into the land of pure cinema. A tale of family and art locked in combat set on the cobblestone streets of Buenos Aires. Bravo Maestro, take a bow.